Last Weekend of 2013: Floyd Bennett Field Hike - With Another Snowy! - And Some Onolicious Soup. Couldn't have asked for a much nicer last weekend of 2013. Saturday was absolutely gorgeous. If we'd gotten our acts together we might have gone kayaking, it was a little breezy but warm enough that that would have been OK. Lucky for the dog, we weren't that organized, so we ended up taking her out for a hike at Floyd Bennett Field. We like the "Back 40" hiking area for walking Bella, so we end up parking over by the Aviator Sports facility. As I mentioned in the Owl Paddle post, my friend Mary, who's a great birder, had mentioned that in addition to the snowy in the marsh islands of Jamaica Bay, several had been spotted at Floyd Bennett, and our friend John D, who's a ranger there, had confirmed that, so I was delighted, but not surprised, when the first thing we spotted after we got out of the car was a small cluster of birders around a scope - and the second thing we spotted was the snowy owl they were admiring. They let us sneak a peek through the telescope, which was very cool - what a handsome bird a snowy owl is! I wish I'd brought my Lumix with the zoom, but at least I'd thought to pop the Pentax in my pocket as we left. Beyond that, just another gorgeous winter day at Floyd Bennett Field. Those loopy vines remind me of those Patrick Dougherty sculptures they had at the Brooklyn Botanic Gardens - remember those? 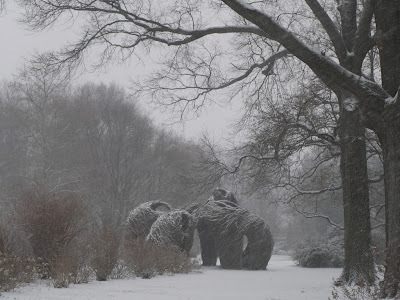 Here they were in the Boxing Day Blizzard of 2010. Happy we haven't had any snow like that yet this winter! However, we did have plenty of precipitation on Sunday, and that actually worked out well. TQ had gotten me a spectacular Christmas present this year, he'd ordered a package of Hawaiian foods - check this out, since the local L&L Barbecue shut down this year, this is better than diamonds! I don't think I'd posted that here yet so yum, here it is! He had them all in his freezer and I was squealing like a teenager at a Justin Bieber concert with each thing he pulled out (amazing that he kept going but he did). The missing item from this picture was a spicy Portuguese sausage - I left that at his place when I brought home the goods because I thought I would share that with him. I would have just cooked it for breakfast (probably with eggs and rice, rice for breakfast is a good Island thing), but I happened to have made pernil last month and I had left a lot of meat on the bone and put that and the pan juices in the freezer for later use. Couldn't think of anything much better to do with that and the Portuguese sausage than a big pot of bean soup. Originally I was going to make that on Saturday, but switched that to Sunday when I realized that Saturday was going to be the Outside Day and Sunday was going to be the Inside Day. We still ate Hawaiian food for dinner after our hike - TQ was curious to try the lau lau and the manapua too so I brought some of that over, along with some poi. Perfect post-hike repast and he liked everything (including the poi)! Sunday it rained all day - perfect for the soup I had in mind. Started out browning the sausage with onions and peppers in the Dutch oven to get some good flavor in the pot - set those and some of the pernil aside to add later and then started the pernil bone (plus a steak bone from Mandy and my post-window steakhouse splurge at Mark Joseph) on a nice slow simmer around 2:00. A few hours and several ingredients later - yum. Now that was a good way to share a Portuguese sausage! And in fact that's what's for dinner again tonight, and I should probably head on over there now. Happy New Year to all if I don't have a chance to post again before it's time to put up the Sebago New Year's Day Frostbite Regatta pictures. Adobo's marinating for the potluck, can't wait! Generally speaking, I don't like crowds too much. Black Thursday? No thank you! Times Square on New Year's Eve? Good heck, you couldn't PAY me enough to be there. But there some things for which I will make an exception, and one of them is my annual trip with my friend Mandy to go see the holiday windows. I can't remember how or when we started doing this but we got to be friends when we were working together at NatWest Markets back in the 90's, so I think that by now this counts as a tradition! That's not Mandy with the pups, btw. That's a picture I took for my friend Gracie, who started taking pictures of dogs doing what dogs do in NYC and posting them on Facebook, just for fun and as a way to keep her page active for her friends (I enjoy it!). Eventually she started putting them up on a blog, Dogs Of New York. Couldn't resist grabbing a shot of this society lady taking the fluffies for a walk in their little coats for her! She's passing in front of Bergdorf Goodman, which was where we started this year. Last year we were a bit disappointed - in the past, we've always sort of saved Bergdorf's for last because their window have alway been these spectacularly detailed surrealist fantasies (think, oh, life-sized polar bears covered in fringe and crystals, entire scenes covered in intricately cut paper or tile and glass, absolutely gorgeous with a mindboggling amount of work in the planning and execution), but last year they pretty much just had female mannequins in clothing they had for sale, set in fairly simple scenes with male mannequins dressed as waiters, ushers, etc., only with animal heads. This year they didn't have as many of the fantasy windows as they have in the past but at least they were back to the elaborate and bizarre scenes. This year's theme was Holiday on Ice. Next stop was the Plaza. I don't think I've actually ever set foot in here but we walked up to look at the fountain that the Fitzgeralds so famously frolicked in (full of evergreens and lights this time of year) and decided to walk in and see if they were serving tea. They were, and although our dining plans this year involved post-window steak, we're now toying with the idea of working in high tea with our window excursion sometime, just for fun. Next stop, heading south on Fifth Avenue - Tiffany's! with tiny silhouettes in the windows. We always love the details they get into these models - look at the chimneys and skylights and water tanks, perfect NY roofscape in our older neighborhoods! Across the street, Bulgari's has adorned their building with a gigantic "diamond" snake armlet. I think this is fairly new, don't recall seeing it before the last year or so. Goes nicely with the giant snowflake that hangs over the intersection. Henri Bendel is not one of our usual stops but Hirschfeld's dinner party grabbed our attention this year. And speaking of Holly Golightly - there she is, gazing uptown towards her beloved Tiffany's. Whoopi Goldberg in the background, of course. Just a few people here! But we'll brave the crowds for one of our favorite windows - Teuscher Chocolates! Always the same every year, but we can't resist their chocolate! Back on 5th Avenue. Empire State Building. With the new LED's, the red and white spire does a barber-pole effect. Tabi! Mandy asked for a quick stop at the Bryant Park gift fair for a calendar she likes. Back out on 5th Avenue in front of the library. Patience (unless it's Fortitude, I assume they're named left to right as you face them but I'm not sure) decked out for the holidays! Last stop before steak, Lord and Taylor. They also traditionally do miniature scenes, not quite on the tiny scale of Tiffany's, but animated, and with music. This year they did something a little new, adding vintage advertising photos to the usual animated miniatures - it made for a very different effect, we liked it. And that was it for our holiday window viewing, 2013 edition - sometimes we've gone on down to Macy's but they tend to only do one new window each year (the rest, they switch back and forth between Yes Virginia There Is A Santa Clause and Miracle on 34th St.) and since it was getting on towards dinnertime by the time we hit Lord and Taylor, we decided we would call that the end of the window tour for 2013. Back to kayaking soon - looking forward to the annual Sebago Frostbite Regatta. Looks like it's going to be a particulary frosty one this year! You just never know who's going to turn up at the Dempsey's Christmas seisiun! Posting Christmas Eve - won't be online much Christmas day. 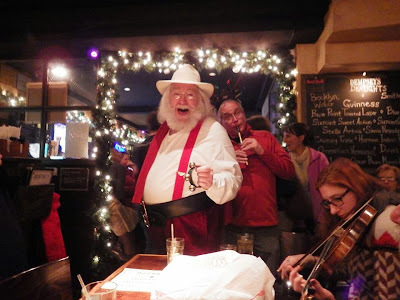 Happy merry and all that good stuff! Well, WOW. This beautiful shot was taken by Don Riepe, our Jamaica Bay Guardian and head of the NE chapter of the American Littoral Society. My birder friends braved the snow and cold we had last weekend for the annual Audobon Christmas Bird Count and apparently there are snowies all over NYC! I'd actually been hearing about this for a while. I think they usually go to Jones Beach but this year there are more and they're all over the place. Jones Beach is where I once got to see one - that was funny, we'd gone out for a seal paddle but it was windy enough that a couple of attendees went for a hike instead, in part because one of them was a birder and had heard that there was a snowy in the area and decided she was more interested in looking for the bird than in bashing a boat into the wind for a few hours (that can get tedious). Sure enough, they found the bird. When we all reconvened later, they told us about it. 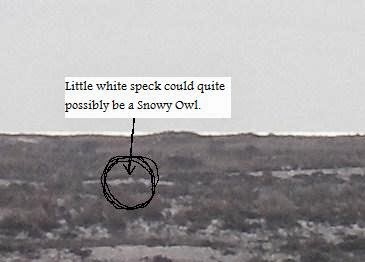 We still had some light left in the day and I asked Prof. M (the birder) to find us the owl. I was TOTALLY kidding but you know what - SHE DID! I was absolutely blown away. To this day I still introduce her as my friend who is such a good birder that she finds snowy owls on demand. Didn't quite have the right camera to take a good picture. Neat seeing one though, even from a distance. There was a very brief and very unpleasant side to this year's higher numbers and wider spread as these are large enough birds to damage plane engines (ugh) - when they turned up at JFK employees were originally told to shoot them on sight (!!!!!!!!). Fortunately after a flood of letters and petitions they switched to a trap & relocate policy. PHEW. Bad enough that the city does mass goose cullings - this one, I don't know what they were thinking. Anyways, all fixed. Hooray for the Internet. I'm especially excited about this one because she's right in the middle of my paddling turf! 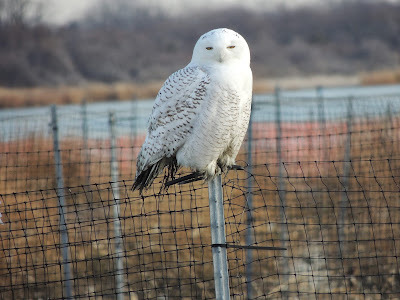 Don's caption: "Snowy owl sightings all over NYC this past week for the Audubon Christmas Count! Out on the boat this morning, we spotted this beautiful snowy owl lady on one of the restored marsh islands in Jamaica Bay." I'm taking advantage of a warm and quiet day to get in a nice quiet Antisocial Paddle (a pleasant antidote to all the holiday togetherness, I was toying with mustering up a group all week 'cause the forecast's been looking so sweet, but here on the first day of a week and a half of vacation I decided to give myself a break from commitments and just go when I feel like going). I was going to head out to Dead Horse Bay but I think I'm going to go out around the islands instead, to see what (or whooo) I can see. Post-paddle update: I still didn't have the right camera, but this is at least better than my last effort at snowy photography, don't you think? Also saw this lovely pair of loons. There was another pair nearby and they kept calling to each other. Four calling birds? Manhattan in the distance. Click for larger versions of both of these. And of course the flocks of brants have all arrived. Here's a sample of the winter chorus of Jamaica Bay! Some of us at Sebago do keep paddling all winter, but not everyone's got the inclination (or the cash, a drysuit can be a very expensive addition to one's paddling wardrobe). However, most members are still very interested in spending time outdoors in pleasant company, so one of our members, Frank F., has volunteered to organize some hikes over the off season. I joined in on one of these yesterday. "The Paumanok trail is a 125 mile trek through wilderness, where you can encounter glacial kettles and erratics, rolling hills with panoramic vistas, parabolic dunes, coastal plain ponds, White Atlantic Cedar swamps, Dwarf Pines, Pitcher Plants, Painted Turtles, fields of Reindeer Lichen, maritime grasslands, Harbor Seals, Harrier Hawks, Olive Hairstreak Butterflies, Cedar Waxwings, and more. Long Island is an island of great natural diversity and the Paumanok Path visits much of it." We didn't see too much wildlife because we were all talking, catching up with each other as we walked, but that was half the fun. The scenery wasn't as dramatic as some hiking areas but it was very pleasant. It was a pretty quick drive, we had people along who knew a lot about the area's geology, which always makes a hike more interesting to me, and the gently rolling hills made for some very nice hiking, not boring but not too hard either. Another good point that Frank pointed out about this park is that it's got a pretty extensive network of trails, so it can actually handle a lot of hikers without feeling crowded. There were a number of cars in the parking lot but except for a couple of gentlemen who were doing trail maintenance for the county, we didn't see anybody else all day! I'm just at the point in recovering from a nasty cold I'd come down with the weekend after Thanksgiving (why do we say "I caught a cold" when it's more the other way around? 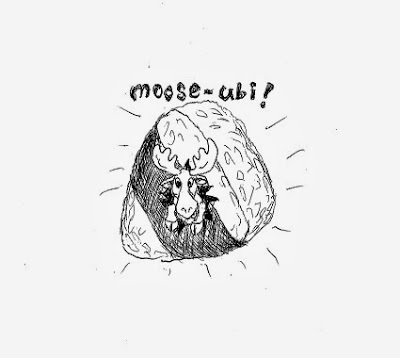 This was an office bug that I'd managed to evade for 2 weeks before it finally got me but when it did, ugh!) that I really felt like it was time for some gentle exercise. if it was summertime, this would've been when I would've go joined my open-water swimmer friends out at Brighton Beach for a slow swim and some basking in the sun - this time of year, though, this hike was just what the doctor ordered. It was hard to get myself out the door in the morning - I got a ride from my neighbor Beth (blue jacket and big smile in the picture above) so I only had to walk a block to meet her, but our meeting time was 7:30 am and it was sooo chilly outside - but I'm very glad I did. Click here for a photo trip report! Cross-posted at the Sebago Canoe Club blog. Home from a very pleasant day of hiking with friends from Sebago. It's snowing in Brooklyn. I am now murdering some clams for chowder. It's been a good day (although not for the clams). Photos taken during a visit to my folks in 2007. That turned out to be their last year living in the islands - TQ came along on this one and I'm so glad he had this chance to see where I'm from. My dad being retired Navy, we got to go on a Navy tour, which runs in much closer along the shore of Ford Island than the public trips go (this is still a working base). That's how I have the picture of the Utah Memorial, which I wanted to share along with the more familiar Arizona Memorial. Battleship Row, with the USS Missouri. The concrete platforms to which the ships were moored are marked with the names of the ships that were there that day. Click here to read more about Battleship Row on that day. Closing with a peaceful picture - outrigger practice on Pu'uloa (Hawaiian name of Pearl Harbor).